Insch rider Sam Munro has long-term aims of reaching the British Superbike Championship. Picture: Jennifer Charlton. Challenging for two titles on the Scottish circuit – all out of his own pocket – has given him the platform to try fulfil a lifelong ambition. 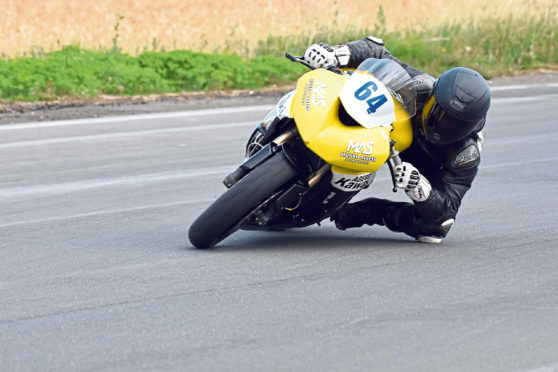 Munro is from a “bike-obsessed” family and splits his time between working for the family firm, Munro Access Services, and prepping his Kawasaki bike for his next race weekend. It is not uncommon for the 25-year-old to come home on an evening and spend the rest of it in the shed tuning and tweaking his ride. He competes in the Knockhill Motor Sports club championship and the Melville Cup, sitting second in both and chasing down leader William Monie for a landmark title in what is only his second season. The pressures of running two championships takes its toll financially but it will be worth it to Munro, if he gets a full-time ride in the British. Munro said: “That’s where I want to be – if I had the right machinery I believe I could run with the front boys. But the budget just isn’t there at the time being. “You’re talking £800 for tires alone for a weekend, then your fuel costs take it closer to three grand. “We would like to enter it on our own bike and the dream is to get paid to ride. It’s all self-funded, so it is very costly. Munro first rode a Mini-Moto at the age of 12 but left the sport at 16, picking it up again after an eight-year hiatus. Weekends in front of the television watching British Superbikes, MotoGP or the Isle of Man TT were not uncommon and it fuelled an ambition to reach the top of the sport. He received a wildcard entry into the British Superbikes last month at Knockhill, writing off his Kawasaki after a crash on lap 14 of the Superstock 600 Championship. l For more information or to contact Sam regarding sponsorship, visit Sam Munro Racing on Facebook.